One of my first major baking endeavors was with my sister-in-law Katelyn, when we made a German Chocolate Cake from scratch. I haven’t made one since, although it’s on my ever-growing baking to-do list. 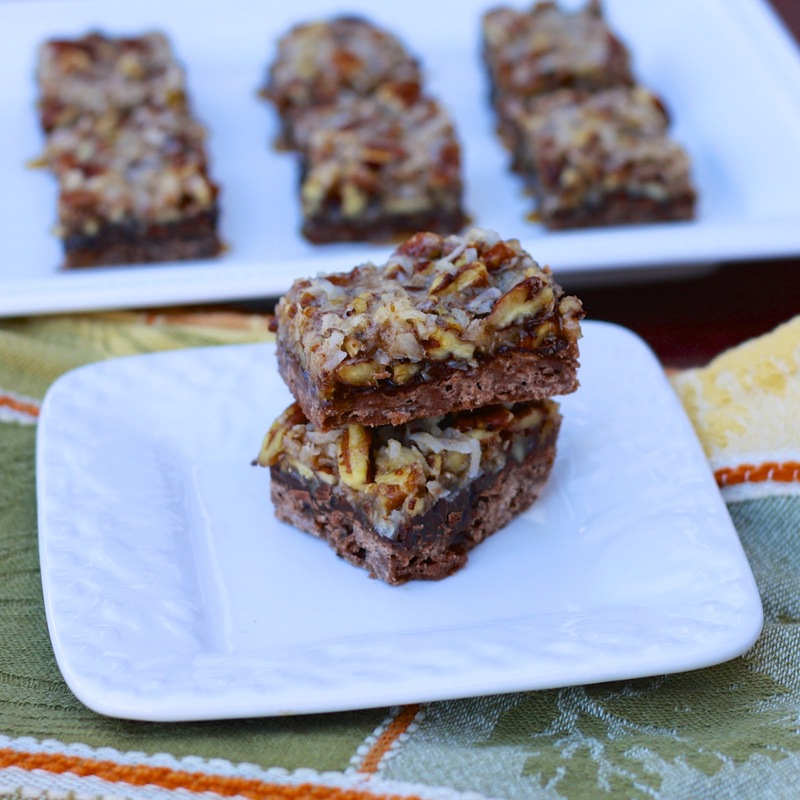 For Katelyn’s birthday this year, I thought I’d give it a go, until I saw the recipe for these German Chocolate Pecan Pie bars. Last year Kate’s birthday dessert was a caramel pecan pie, per her request. Two favorites desserts > one favorite dessert so rather than try and choose between the two, I went for the gold! 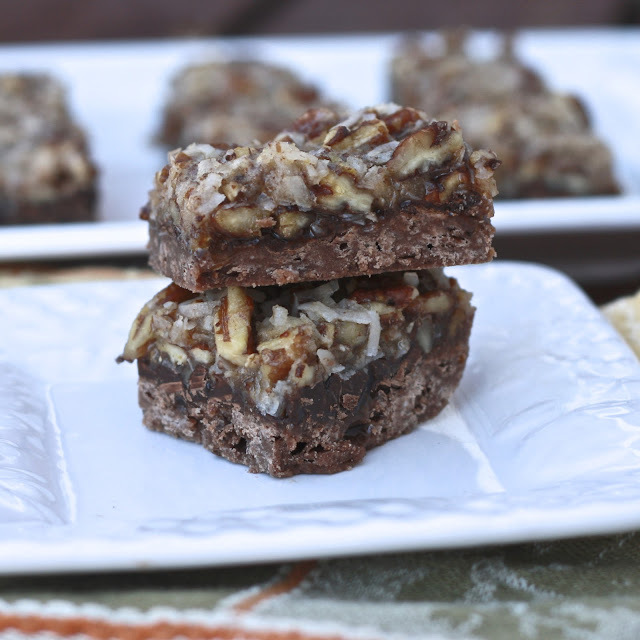 These might be better than German Chocolate Cake. They’re just as rich (a small piece will satisfy!) but the dense chocolate base was much preferred to a cake base, which is often too dry or too crumbly. 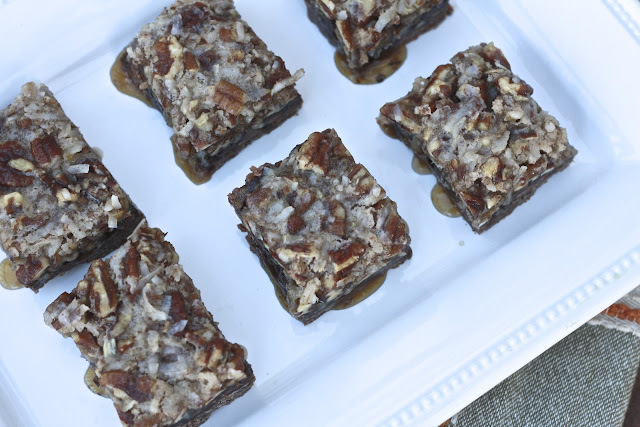 The gooey pecan topping is reminiscent of pecan pie, but with less of that sickly sweet, cavity-inducing chew. Even better, these bar cookies are way easier than rolling out a pie crust or delicately balancing cake layers. 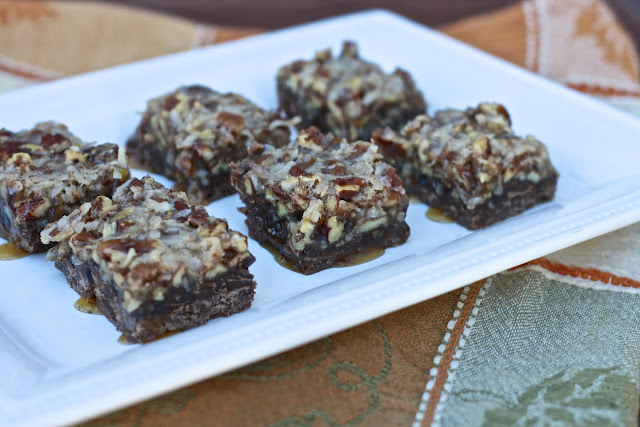 If you love German Chocolate Cake or pecan pie, you won’t be disappointed with these! 1. Preheat oven to 350F. Arrange pecans in a single layer on a baking sheet and toast in oven for 8-10 minutes, stirring halfway through. 2. Line a 9 x 13 inch baking pan with foil and grease with cooking spray. Set aside. 3. In a large bowl, whisk together flour, confectioners' sugar, and cocoa. Add cubes of butter and use a pastry blender or a fork to combine until mixture resembles coarse meal. Press mixture into the bottom of the prepared pan, pressing about 3/4-inch up the sides. 4. Bake for 15 minutes. Remove from oven and immediately sprinkle chocolate chips over the crust. Allow to sit and cool for 30 minutes. 5. In a large mixing bowl, beat eggs. Add brown sugar, corn syrup, and melted butter, whisking to combine. Stir in coconut and toasted pecans. Pour mixture over crust, spreading evenly.